Fresh fish and premium sakés highlight this pan-Asian eatery. : Revered for its freshwater lakes and mountain vistas, Vermont is not the first place you think of for excellent sushi. But Asiana House will change your mind in a heartbeat. And while the ethnically diverse selection at Asiana House swings from Indonesian satay to Korean barbecue, the Burlington hot-spot packs in pedestrians hungry for sushi above all. 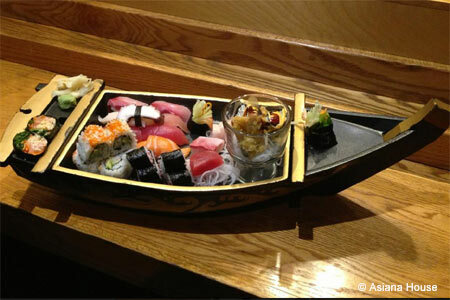 From simple sashimi to trendy rolls like torched salmon with avocado, the treats are abundant and elegantly presented. Especially sure to please are crispy crab maki (hearty rice-bound wraps stuffed with cream cheese and sweet, flaky crustacean) and spicy tuna maki with just a hint of tempura crumb. Don't miss the chance to pair a fresh piece of maguro with one of the restaurant's premium sakés; we enjoy a lightly chilled bottle of Tozai Living Jewel, with its floral notes complementing the fatty savor of bluefin. Not into seafood? The kitchen also prepares rib-eye steak with Korean barbecue sauce and kimchi, soba noodles and custom vegetarian rolls that taste just like the real thing. With only a dozen tables, the room fills up quickly, so come early and pique your appetite with one of the bar's fetching cocktails.